Nate's Nonsense: Dakota Territory Photos for Everyone! I'm sad to report that Super Villain PJM of West Texas is continuing his campaign of cyberbullying on his propaganda blog, Old Photo of the Day. While I did not choose to start this feud, I am man enough to take the constant barrage of vitriol he throws my way. Unfortunately, PJM has taken kindly Nate's Nonsense reader, DADD, into his diabolical crosshairs today and is currently withholding photos of Dakota Territory unless DADD abandons his noble crusade against Super Villainy on OPOD. In an attempt to provide relief to DADD while he is currently under assault, today I am posting not one, but two photos of Dakota Territory. The above photo is labeled, but this is Sturgis, Dakota Territory, streets packed with oxen teams. 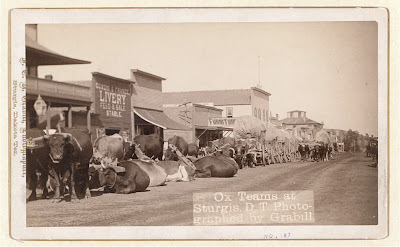 I found it interesting as Sturgis still packs its streets with vehicles even to today. Adept readers of OPOD will also note that the Super Villain posted what he said was a photo of ordinary Indians in a Montanan teepee. 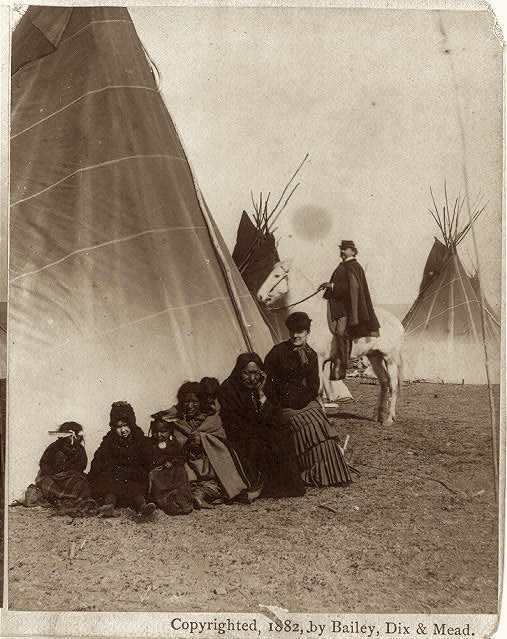 For DADD, I'll post famous Indians and Dakota Territory teepees! So, DADD, here's to you! Hope you remain resolute in your righteous Comment Embargo! May PJM soon relent and provide you the Domestic Updates you desire – and may peace prevail in Chickie Town. note that those teepees are sewn canvas. Thats a great Sturgis picture. I wonder what street that is. I like looking at old photos of street scenes and comparing them with current day using Google street view. Now you've done it. Whipped up quite the frenzy over at OPD. Yeah the Stugis shot is is good one. I was through there a couple times back in the 90's. Beautiful country for sure. Those 'then-and-now' photos are great. Truly you and PJM should let this "feud" thing go. It's too edgy and is going to bother some folks. It's bothering me. I go to the old picture sites because the pictures fascinate me and for no other reason. I think the feud is hilarius. Nate should be a stand up comic.